We have been providing minibus services in Ireland for over 20 years and are well known for our excellent rates & reliable service. We provide Minibus & Coach Hire throughout Ireland and as such can transport a range of group sizes from 8 to 100 people. We specialise in a broad range of minibus services including local tours, extended tours, parties, transfers & corporate events. Our buses are finished to the highest standards with DVD & Karaoke on board for a truly unique experience. Book us in advance to avoid the stress in transfers from Dublin Airport. We are experts in scenic tours of Ireland with custom routes to suit your needs. Get the party started with DVD & Karaoke on board for a unique experience. Our 18 seater with custom luggage trailer is very popular for groups of golfers. 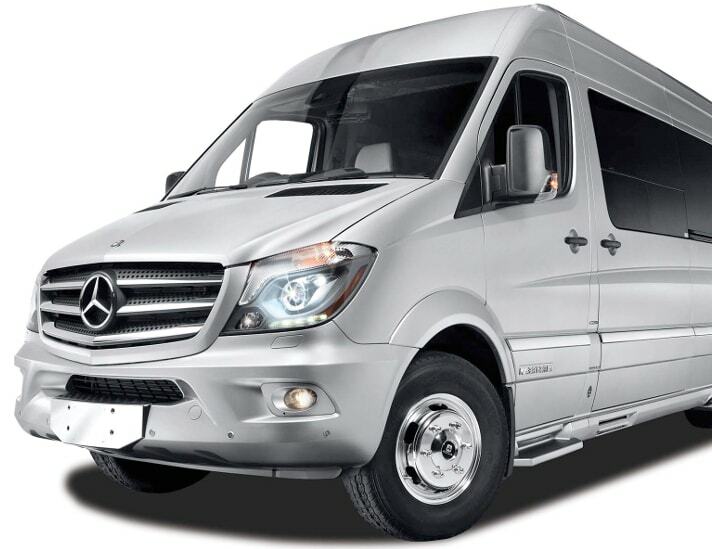 We have achieved unparalleled standards in passenger transportation with the vehicles we have chosen. Comfort & safety is guaranteed thanks to the luxurious seating design and luxury specification combined with state of the art electronic braking system (EBS), anti-lock braking system (ABS) and disc brakes all round demonstrate our commitment to passenger & driver safety. First, I wasn’t that excited to come over to Ireland because it’s cold, but when I went over, I saw how cool all the people were and I changed my mind. I met this guy called Anthony - he’s a driver for M.T.V. Minibus Hire and I can’t wait to see that guy again. He’s cool as hell, that’s my dog. Like I said, everyone was cool. Tommy, you made our trip worthwhile! Because you were in time and made our trip a part-vocal event, we had the best company-day-out! The karaoke set and your patience made me recommend your company to many more. Thanks again and great doing business! Got this bus down to Carrick on Shannon for my hens and have to say would highly recommend Tommy he was such a lovely gentleman! Made everyone feel so welcome and had the patience of a saint with all the stopping for the toilet breaks! Thank you so much Tommy from myself and the girls. Tommy, you made our trip a wonderful learning experience. Your happy smile and helpful ways made our day. We found you very helpful and considerate to our needs and you made my grandchildren very proud of their Irish heritage. What a brilliant stag weekend, with a great bunch of lads. Big special thanks to M.T.V. Karaoke Bus which was unbelievable up and back & the Driver Tommy was a gent, highly recommended! Thanks again and will see you all the wedding. Big thank you for M.T.V. Minibus, we had an amazing time from Dublin to Galway and back, there was an ice bucket to keep the drinks chilled, Tommy our driver was a true gent, the music was brilliant and we could play our own tunes via Bluetooth, so really incredible, thanks again. Fantastic service, thanks so much Tommy and all at M.T.V. Minibus Hire for a safe and fun road trip to Belfast. We all had so much fun on the karaoke bus for Tara's Hen Party. We will definitely be recommending you guys to all of our friends! Thanks again Tommy and all at M.T.V. Minibus Hire for a great night. We all had great fun travelling to and from my mam's wedding and it really got the day started for us. The karaoke was hilarious and we all had a ball! Thanks Tommy for making this day so very special for us - it's been lovely. Tommy and Mary, thanks a million for looking after us, excellent service and we will be recommending you to our family and friends. M.T.V. Minibus Hire is a Dublin based, private hire minibus company with over 20 years experience in the business. We are an International fully licensed & insured operator offering very competitive rates with a friendly and reliable service throughout Ireland. Copyright © 2019 M.T.V. Minibus Hire. All Rights Reserved. Privacy & Cookies.